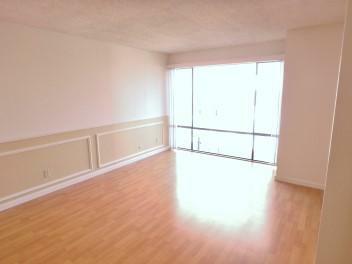 The studio is in a great location, and is bright and quiet with a good layout. The entry opens to a short hallway which has two large sliding door closets, and which also accesses the bathroom. The hallway ends at a large main room consisting of a living area, an alcove for a bed, and a kitchen along one wall. The kitchen features a dishwasher, an electric oven and range, and an in-sink disposal and a granite counter top. The bathroom has a sky light, a recently-updated vanity and medicine cabinet, and a shower-over-tub. The location is very close to shops and restaurants on Union and Fillmore Streets. There is easy access to the 101 north freeway, and Lafayette and Alta Plaza Parks are three to four blocks away. The building has an elevator and a large outdoor common area. Included utilities are water and waste disposal.